I squandered on vices the wealth which Thou gavest me. I have sinned before Thee, O compassionate Father. And he said, A certain man had two sons: And the younger of them said to his father, Father, give me the portion of goods that falleth to me. And he divided unto them his living. And not many days after the younger son gathered all together, and took his journey into a far country, and there wasted his substance with riotous living. And when he had spent all, there arose a mighty famine in that land; and he began to be in want. And he went and joined himself to a citizen of that country; and he sent him into his fields to feed swine. And he would fain have filled his belly with the husks that the swine did eat: and no man gave unto him. And when he came to himself, he said, How many hired servants of my father’s have bread enough and to spare, and I perish with hunger! I will arise and go to my father, and will say unto him, Father, I have sinned against heaven, and before thee, And am no more worthy to be called thy son: make me as one of thy hired servants. And he arose, and came to his father. But when he was yet a great way off, his father saw him, and had compassion, and ran, and fell on his neck, and kissed him. And the son said unto him, Father, I have sinned against heaven, and in thy sight, and am no more worthy to be called thy son. But the father said to his servants, Bring forth the best robe, and put it on him; and put a ring on his hand, and shoes on his feet: And bring hither the fatted calf, and kill it; and let us eat, and be merry: For this my son was dead, and is alive again; he was lost, and is found. And they began to be merry. Now his elder son was in the field: and as he came and drew nigh to the house, he heard musick and dancing. And he called one of the servants, and asked what these things meant. And he said unto him, Thy brother is come; and thy father hath killed the fatted calf, because he hath received him safe and sound. And he was angry, and would not go in: therefore came his father out, and intreated him. And he answering said to his father, Lo, these many years do I serve thee, neither transgressed I at any time thy commandment: and yet thou never gavest me a kid, that I might make merry with my friends: But as soon as this thy son was come, which hath devoured thy living with harlots, thou hast killed for him the fatted calf. And he said unto him, Son, thou art ever with me, and all that I have is thine. It was meet that we should make merry, and be glad: for this thy brother was dead, and is alive again; and was lost, and is found. Let all who love their words come together and honour with hymns/ the three luminaries of the light-creating Trinity:/ Basil the Great, Gregory the Theologian,/ and renowned John of golden speech,/ who have enlightened the world with the rays of their divine doctrines,/ and are mellifluous rivers of wisdom/ who have watered all creation with streams of divine knowledge;/ they ever intercede with the Trinity for us. Thou hast taken the sacred and divinely inspired heralds,/ the crown of Thy teachers, O Lord,/ for the enjoyment of Thy blessings and for repose./ For Thou hast accepted their sufferings and labours above every burnt offering,/ O Thou Who alone dost glorify Thy Saints. During the eleventh century, disputes raged in Constantinople about which of the three hierarchs was the greatest. Some preferred St Basil (January 1), others honored St Gregory the Theologian (January 25), while a third group exalted St John Chrysostom (November 13). I am the father of two young daughters who are now of an age in which playtime and imagination consist largely of princesses, princes, and other fairy things. The older child is also developing a sense of the happy ending, the resolution to the crisis encountered in the tale, the promised chaste kiss awakening to new life. It occurs to me that I may one day have to face these little ladies who will have developed the capacity to compare the reality of life to the constructions of fantasy. There is and will be, of course, as there always must be, a sharp disconnection between the happy ending of the world of romance and what is perceived to be the lack of such in day to day living. My task, of course, will be to address this seeming dichotomy. I’m not sure what I might say in that day to come. But if I’m attentive, it may sound something like this. There are two sorts of happy endings: the happy endings of fairy tales and the happy endings of daily life. The former are the sorts of resolutions which human desire constructs; the latter what a merciful providence provides. The happy endings of fairy tales call forth in us the desire for communion. The happy endings of providence satisfy that desire for communion. The happy endings of fairy tales satisfy our expectations. The happy endings of providence transfigure our expectations. The happy endings of fairy tales reveal to us an unhappy truth: our lives are not fairy tales. The happy endings of providence reveal to us a most happy truth: our lives are not fairy tales. There must be something in a little girl’s heart that causes her to yearn for that fairy tale happy ending. And her father, when he sees his daughter’s disappointment on realizing her fairy tale happy ending cannot come, has his heart broken a little bit, too. He, too, though he knows better, yearns for that happy ending for his little girl. But his is a different duty, a task he cannot shirk: he must take that sorrowful chin in his hand, and turn that tearful gaze of disappointment in another direction. I am sorry that I cannot give you the happy ending that you want. I am sorry that I cannot change the circumstances which frame our lives. I am sorry that you must learn this hard truth: the happy endings we often want, or think we want, will never come. Still, Christ the Savior loves us, and if we pay attention, we can create a different story with him. Our story will have happy endings, but not the kind you find in fairy tales. These happy endings God gives us are much better, and richer, and last forever. I know you look around for a happy ending, and do not think you see one. But if you ask me, where is the happy ending? Dear one, there is only one answer to give to you: you are my happy ending. Soaring with love for Him Who holds thee in His hands,/ thou wast shown to be a Godbearer, O Ignatius./ Thou didst finish thy course in the West/ and pitch thy dwelling in the unwaning day of the heavens./ O righteous Father, entreat Christ our God to grant us His great mercy. Like a treasure of rich and abundant gifts/ thy relics were carried piously from Rome to thy flock./ Whilst lovingly celebrating their return/ we receive the grace of healing of our souls and bodies: /and we ever sing of thy martyr’s contest, O glorious Hieromartyr Ignatius. Thou didst rise in the East today,/ and having enlightened all creation with thy teachings/ thou wast adorned with martyrdom, O Godbearing and divine Ignatius. Later, in the year 108, the saint’s relics were collected and buried outside the gate of Daphne at Antioch. A second transfer, to the city of Antioch itself, took place in the year 438. After the capture of Antioch by the Persians, the relics of the Hieromartyr Ignatius were returned to Rome and placed into the church of the holy Hieromartyr Clement in the year 540 ( in 637, according to other sources). By a flood of tears you made the desert fertile,/ And your longing for God brought forth fruits in abundance./ By the radiance of miracles you illumined the whole universe./ O our holy father Ephraim, pray to Christ our God to save our souls! The Holy Martyr Felicitas with her Seven Sons, Januarius, Felix, Philip, Silvanus, Alexander, Vitalius and Marcial. 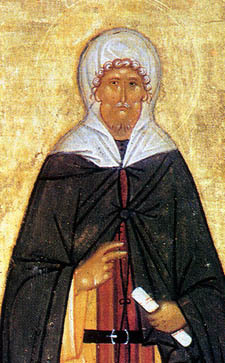 St Felicitas was born of a rich Roman family. She boldly confessed before the emperor and civil authorities that she was a Christian. The pagan priests said that she was insulting the gods by spreading Christianity. St Felicitas and her sons were turned over to the Prefect Publius for torture. St Felicitas witnessed the suffering of her sons, and prayed to God that they would stand firm and enter the heavenly Kingdom before her. All the sons died as martyrs before the eyes of their mother, who was being tortured herself. St Felicitas soon followed her sons in martyrdom for Christ. They suffered at Rome about the year 164. St Gregory Dialogus mentions her in his Commentary on the Gospel of St Matthew (Mt.12:47). As a Christian, Felicitas was condemned to death along with her seven sons during the reign of Emperor Antoninus in the year 164 A.D. She implored God only that she not to be killed before her sons, so that she might be able to encourage them during their torture and death in order that they would not deny Christ. According to God’s Providence, it so happened. With joy, this superb mother accompanied her sons one by one until she had witnessed the death of all seven sons. Then, she herself, with gratitude to God, received a martyr’s death. She and her sons suffered in Rome where their relics repose. The shepherd’s pipe of thy theology/ conquered the philosophers’ trumpets;/ for since thou didst search out the depths of the Spirit,/ beauty of speech was added to thee./ Intercede with Christ our God that our souls may be saved,/ O Father Gregory. With thy theologian’s speech thou didst dispel the philosopher’s cobwebs,/ O glorious Gregory;/ and thou dost adorn the robe of Orthodoxy woven for the Church from on high./ Wearing this, she cries out with us thy children:/ Rejoice, O Father, most excellent mind of theology. Gregory was born in Nazianzus of a Greek father and a Christian mother. Before his baptism, he studied in Athens along with Basil the Great and Julian the Apostate. Gregory often prophesied that Julian would become an apostate and a persecutor of the Church which actually happened. Gregory was especially influenced greatly by his good mother Nonna. When he completed his studies, Gregory was baptized. St. Basil consecrated him as bishop of Sasima, and Emperor Theodosius the Great summoned him to fill the vacant archepiscopal throne of Constantinople. He wrote numerous works of which his most famous are those concerning theology for which he is called The Theologian. Especially known because of its depth is his work: Homilies on The Holy Trinity. Gregory wrote against the heretic Macedonius who erroneously taught that the Holy Spirit is a creation of God and, Gregory also wrote against Appolinarius who erroneously taught that Christ did not have a human soul but that His divinity was in lieu of His soul. Additionally Gregory wrote against Emperor Julian the Apostate, his one-time colleague in school. In 381 A.D., when a debate began regarding his election as archbishop, he withdrew on his own and issued a statement: “Those, who deprive us of our archepiscopal throne cannot deprive us of God.” After that, he left Constantinople and went to Nazianzus and there lived a life of solitude and prayer, writing worthwhile books. Even though he was in poor health throughout his entire life, nevertheless, Gregory lived to be eighty years old. His relics were later transferred to Rome. A reliquary containing his head reposes in the Cathedral Church of the Assumption in Moscow. He was, and remains, a great and wonderful light of the Orthodox Church as much by his meekness and purity of character as well as for the unsurpassable depth of his mind. He died in the Lord in the year 390 A.D.
Saint Gregory the Theologian, Archbishop of Constantinople, a great Father and teacher of the Church, was born into a Christian family of eminent lineage in the year 329, at Arianzos (not far from the city of Cappadocian Nazianzos). His father, also named Gregory (January 1), was Bishop of Nazianzus. 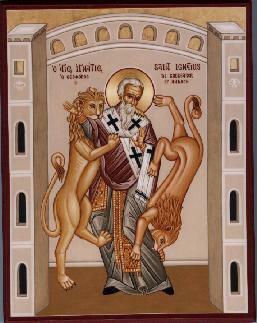 The son is the St. Gregory Nazianzus encountered in Patristic theology. His pious mother, St. Nonna (August 5), prayed to God for a son, vowing to dedicate him to the Lord. Her prayer was answered, and she named her child Gregory.